Trying out a new style of analysis which I hope to use more in the future. Japan move the disc away from the end zone they are attacking; defensive confusion ensues. 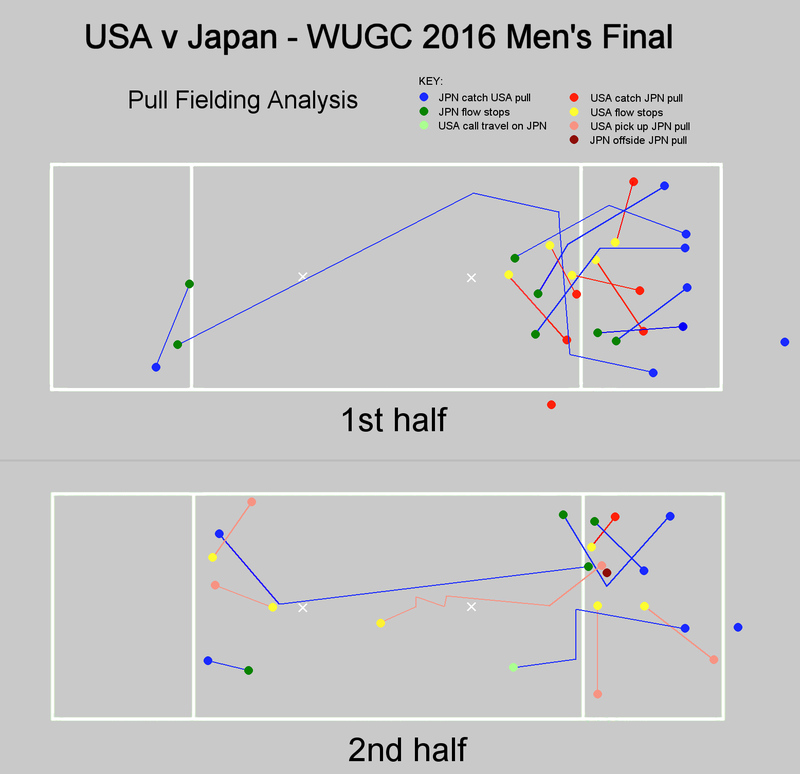 I’ve been taking some time recently to analyse Japan’s defence against USA in the WUGC 2016 Final, and posting a series of mini analysis pieces on reddit. Ever since I saw Buzz Bullets in Australia winning WUCC 2006, I’ve been inspired by their alternate approach to defense. Here is a team that play defence like a team. Defensive teamwork has been largely overlooked in the development of Ultimate strategy, with focus being on how to beat your one-on-one matchup, or different zonal approaches looking to generate turns through specific scenarios. Buzz worked together and it was difficult to see what their aim was, or where they were coming from. However, it was incredibly effective, mind opening, and intriguing. Below are a number of breakdowns which I originally posted to reddit /r/ultimate – I was waiting to compile my conclusions into a neat article for felixultimate.com, but now I figure content content content – if I’m writing it then I should be publishing it. By the end I will have improved my knowledge of Japan’s defence, so will be in a good position to write a summary piece. For now it’s more of a train-of-thought style approach. Originally I thought this was a smooth switch on Beau, but after a few views it becomes clear it’s a couple of moves by individuals rather than coordination between them. The Japanese defenders sprint downfield after their mark releases a throw down the line, meaning their defensive efforts are weighted towards disrupting immediate throws down the line & short passes off the line, at the expense of allowing an offensive player to be immediately free in the backfield. USA’s style means they are unlikely to look infield or towards the backfield until around stall 3, at which time the Japanese defenders tighten up to their original marks to prevent continuations. The defensive movement is efficient – the first clogging defender moves a shorter distance than their mark over the course of the clip, is next to their mark at the start and the end, and manages to cover a second offensive player in the middle. The second clogging defender moves the same distance as Beau, but by pre-empting his movement he’s also able to pressurise another offensive player cutting up the line during the first three seconds of the next stall, and still be covering Beau when he next looks to make a move. If the USA cutters turned infield (to their right) after catching, and looked to utilize the free player in the backfield, they would sacrifice yards in exchange for moving the disc off the line with fluid motion, countering Japan’s immediate clogging tactics by making their defenders movements inefficient. Such an early backwards pass would be a stark contrast to the traditional style of Ultimate which USA champions, and using this style the USA retained possession here and won this game. First thing that catches the eye here is Japan’s #5 not following the early deep cut, but switching onto Beau instead – he’s likely been given the task of stopping the first under threat whilst a teammate picks up the deep threat (a fairly common tactic to stop set plays). More interestingly, the two Japanese defenders towards the top of the screen position themselves so they are able to see each other, and then communicate via gesticulation – pointing out the threat they want the other player to cover. They haven’t decided exactly who they will be marking until they arrive and analyse the situation. If Mickle (cutting under on the far sideline) had arrived earlier, it’s quite possible the Japanese defenders would’ve chosen to mark different players. Both defenders react immediately to the shared communication, and take their marks. This one-second of communication & teamwork puts USA on the back foot and results in a stall-6 layout save. USA may be applying the old adage “run through the poaches” here, however the Japanese players are not really poaching – after the first couple of seconds they are each covering a specific mark. Note how every defender glances frequently between their mark, the disc, and the space – dynamically reacting to the positioning/space and where the thrower is focusing, so they are able to save their energy by only committing to cover realistic & time-critical threats. This gives the impression of poaching, improves the efficiency of their movement, and helps facilitate dynamic switching of marks. It’s apparent that Japan run down the pull matching person-for-person, and when they arrive they re-analyse, focusing on communicating and switching where possible. This maximises their effectiveness and adds an unpredictable element which often negates any set play the opposition has planned. As the disc is in the air moving downfield, the Japanese defenders behind the disc all bust a gut to get in front of it again. There are a couple of slight errors as Japanese defender #16 is trapped between two defenders and without a mark. He tries to communicate initially to get the player on the far sideline marked, and then to push white hat #97 onto marking the near-side handler. At the very end of the clip he switches again to make his teammate on the far sideline’s job easier. Whilst all this defensive switching & re-marking is going on, USA #4 Schlacket has slipped through the net and is temporarily unmarked. #10 Matsuno, who may have poached to stop Beau’s deep cut, recognises this and has begun to close him down at speed before the disc is thrown, but is narrowly unable to get there in time to stop the pass. This is a mistake from Japan, caused by a misunderstanding and/or a lack of communication. As the two USA offensive players meet, the deeper Japanese defender (#16 Jun Kusano) seems to expect he and his nearby teammate will form a sandwich around the two cutters, and positions himself accordingly – covering any deep moves and expecting his teammate to cover either cutter going under. At the moment just before the USA player moves, the positioning looks all good for a sandwich (they could even work together with the other nearby defenders to make it 3v3 or 4v4), however when the under cut happens it becomes clear that yellow-boots is not aware of the plan, and the opportunity has been missed. What’s interesting is that Kusano was expecting the sandwich to happen, suggesting it is an element of the defence which Japan have agreed upon / practiced. If the USA players moving towards each other had triggered all the nearby Japanese defenders to look to set up a sandwich, it could have presented the USA with an unfamiliar situation from which they would need to work to get free, and upped the defensive efficiency by requiring less movement. This would have looked like classic confusing Japanese not-quite-man, not-quite-zone defence. Kusano was on the Buzz Bullets’ universe point D line against Ironside at WUCC 2014, and scored the winning point. Yohei Kichikawa – who blows the sandwich here – is also a veteran Buzz player and the top assister for Japan in 2016. It’s possible Kichikawa was given the strict matchup of Mickle for this point, making him exempt from what are revealed to be standard switching/sandwiching defensive moves by Japan. Japan have a tendency to not mark anyone behind the disc until after stall 3, meaning they’re in a good position to counter this classic ‘dump and give-go’ move (often seen run by Freechild) with a switch. Mizuho Tanaka (red headband) shouts and points as soon as Kolick releases the disc, but Kichikawa is already aware & moving to switch – meaning both players are familiar with and practiced at switching in this situation. This is an often-seen switch made by Japan & Buzz Bullets – in GB in 2011 we practiced emulating it and called it the ‘Buzz switch’, although with so much to learn about switching this name now seems too generalised; something like the Dump-Give-Go Switch could suit it, as the dump pass & sagging off the 2nd dump for the first 3 seconds of the stall is an important element. A switching principle that could be applied is “*if a teammate is in a better position to cover your mark, and you are in a better position to cover theirs, switch*”. This sounds obvious, and if you check the defenders positioning as Kolick releases the disc you might agree that not switching in this situation would be a big mistake. #2 Tanaka passes his deep-cutting mark off to #10 Matsuno who has allowed his player to get the disc under – Tanaka gesticulates for clarity as this happens. Matsuno is clearly prioritising covering the deeps for this point, as his mark is completely free under a second time, however this time no switch occurs and he is seen at the end of the clip arriving late to close down the thrower. Matsuno crossing paths with #80 Kichikawa at the end of this clip is an indication that an opportunity for a switch has been missed, and there has been an inefficiency in the defense. Kichikawa can be seen considering the switch when he’s running past Matsuno’s mark (Gibson) earlier – he was likely reluctant to take it as he was unsure whether the mark he was leaving would be picked up by a teammate (unlike Tanaka’s switch earlier, where he visually connects with Matsuno first). Ideally Tanaka, Kichikawa and Matsuno are all fully aware of where each other and and where each other’s marks are, so can make split second decisions to switch when the opportunity arises. Tanaka has been beaten deep – he should be immediately passing his mark to Matsuno and looking to pick up Matsuno’s previous mark, or at least see where he can help under. Kichikawa is in a great position to switch onto Gibson – if he did this whilst Tanaka was heads-up analysing the situation, then Tanaka could take Kichikawa’s previous mark, and Matsuno would be marking the off-screen player in the end zone. This is a triple-switch, which can be difficult to perform in such a fast-moving, rapidly changing situation, but is possible if all defenders have their heads up to the situation, have a constant communication channel open, and know they are looking to switch whenever it can benefit them. The cause of the breakdown of the defence in this clip is off-screen poaching from Matsuno, without a switch being initiated by him, Tanaka, or Kichikawa. The deep poach from Matsuno gives false security to Tanaka, who does not fully commit to following his mark’s deep cut, but does not commit to taking Matsuno’s mark either. This has the knock-on effect of putting more reliance on Matsuno’s poach, meaning he has to stay in the deep space for longer, and his mark is able to both get the disc and throw a flat cross-field break. This is the fundamental problem with poaching without switching – it encourages the other defenders to play to your poach, meaning you become trapped whilst there is a completely free offensive player elsewhere on the field who will get the disc, and will break your defence down. If Matsuno, Tanaka or Kichikawa had tried to switch, then the deep space would have remain covered by Matsuno, and Tanaka & Kichikawa would have had to only make small movements to make sure all remaining offensive players were relatively covered. Very difficult, but possible if all defenders are heads-up and on the same page. Japan don’t care about marking players who are behind the disc – you can see #17 look around to find alternate marking options when his player occupies the backfield. He does however make a mistake at the end of the clip by paying too much attention to the thrower and biting on a backfield threat. #3 Yasuo Takahashi, top left, bumps into Beau early on in the clip, then points and shouts in order to pass him off to a deeper defender. When #19 Mickle comes near to him, he takes him as a mark, but doesn’t follow him into the backfield – instead takes the force. #19 Masashi Koike as the central defender is the first to point and shout to pass off an offence player who is jogging deep. Note how often he looks at the disc, checks the space around him, points to any nearby offensive options, and closes down offensive players when they are potential threats (depending on the status of the disc). #7 Yuta Inomata enters screen left after a few seconds, and is also clearly conditioned to point and shout at any nearby offensive players, as he does three times in these first few seconds of defense. He makes a mistake however – not marking #4 Schlacket, who receives the “zone-busting” pass at the end of the clip (though I would not call this defence a ‘zone’). The reason Inomata did not mark Schlacket was two-fold – firstly, he was in a zonal mindset, (falsely) trusting that #19 Koike would pick up any player in the middle of the field. Secondly, he was drawn towards drawn towards a deeper offensive player who must have posed a threat (we can’t say for certain as we can’t see the deep marking). #19 Koike, who starts as a central defender, was occupied with a live offensive threat on the sideline, however by slightly poaching he sent a false-positive signal to #7 Inomata that he could cover a central offensive threat, hence why this player was left unmarked. If the deep marking was tighter then this would have sent Koike a positive signal that he could commit to marking Schlacket and not worry about the deeper threat. Of course the tighter deep marking would have increased the risk of a USA huck – which was likely against the general Japanese team-strategy for this game. The interesting positive theme of this clip is the repeated pointing and shouting whenever a Japanese defender identifies a potential offensive threat – even if it isn’t always directed towards a specific teammate. This is clearly a cornerstone of the defence – communicate the location of offensive players through gesticulation and vocalisation. What could be improved, is making sure every offensive player is covered, as this would help prevent the “zone-buster” to Schlacket. It’s worth noting the root cause of the offensive player being unmarked was a knock-on effect of poaching (by #19 and the deep defenders), meaning #7 Inomata felt he could pass off Schlacket rather than mark him. The first thing I notice is the Japenese defender #3 Yasuo Takahashi at the top of the screen, passing off an offensive player (Schlacket) as they run down the wing – pointing in their direction as #81 Masatsune Miyazaki picks them up. Watching #81 Miyazaki from the start (on the very left of the screen), you notice he allows an offensive player to move away from him across the width of the field, but he points in the general direction they went, which alerts #19 (Koike) to the potentially unmarked player. Miyazaki tracks Schlacket for the remainder of the clip, continually checking in with the disc and the other defenders around him. #19 Koike in the centre also points towards Schlacket as he moves down the line, and later gesticulates towards the deep space as he moves towards it. Why does he prioritise the deep space? In the backfield at that moment there are three defensive and three offensive players, meaning the situation is balanced. In the deep space however there are 4 offensive players and 3 defenders – until he arrives to help. I believe Koike is player-counting, and that this is an important job for whoever finds themselves in the central defender position. By keeping track of the ratio of downfield vs backfield players, the central defender is able to position themselves to keep the field balanced, and prevent a heavy concentration in any particular area – which often leads to a defensive breakdown. It is of course critical for them to stay in constant communication with the rest of the team whilst doing this, as they act like the central node in a network. A fairly clear ‘rule of thumb’ for the Japanese defence which we can extrapolate from this clip is one which we also identified in a previous clip: communicate the location of offensive players through gesticulation and vocalisation – especially important if those players are potentially unmarked (i.e. when you let your mark leave you). This would fall under the general defensive principle of communicate. Less clearly, it appears the central defender is trying to maintain the balance of players on the field by player-counting and adjusting his positioning accordingly, which essentially leads to every defender having a mark / every offensive player being covered / no area being overloaded. Whether this is a rule of thumb, a principle, or part of a more general principle being adhered to is currently unclear, although the next clip I will analyse shows it is definitely an area of focus for Japan. These two elements of the Japanese defence work very well together – through each defender communicating where the potentially free offensive players are moving around the field, and trying to maintain field balance, the team can work together like a network, and is able to flex in order to cover the offensive team’s movement & positioning, as commentator Bryan Jones makes note of during this point. This level of teamwork lifts the ceiling off what is usually expected from traditional approaches to defence. #19 Koike, in the centre of the field, crashes towards the disc / backfield space at the start of this clip, at the same time as two USA players move into the backfield space. For a moment, it’s 4v4 in the backfield, but then Koike moves away. This leaves the backfield defenders overloaded, and #17 Furikado is torn at the end between following his mark down the line, or taking Mickle in the backfield. Koike’s slight lapse in concentration is addressed as Furikado shouts and points to the free player – Koike acknowledges and marks up. He’s acknowledging with both hands, so I wouldn’t be surprised if a deeper defender was also communicating with him – they could be saying they’re already marked up 3v3 in the deep space so Koike should be picking up his mark from the backfield. The root of this slight error started when the Japanese defender at the top of the screen (#3 Takahashi, although we don’t see his number as he’s facing infield the entire clip) poached off a player in the backfield and gesticulated to Koike to move deeper – pointing to a player that was already covered by #81. This left Koike without a mark, meaning the defence was being overloaded in the backfield. Although Japan are not concerned with marking players tightly in the backfield, if they keep track of the number of players behind the disc and match them with players just in front of the disc, then they won’t be overloaded when the offence start to advance forward. Koike’s attention should have been focused on the players behind the disc, and this was where the next potential unmarked threat would be coming from – if the downfield defenders are doing a good job then he should leave them to mark 3v3. I believe this is the lapse he acknowledges. 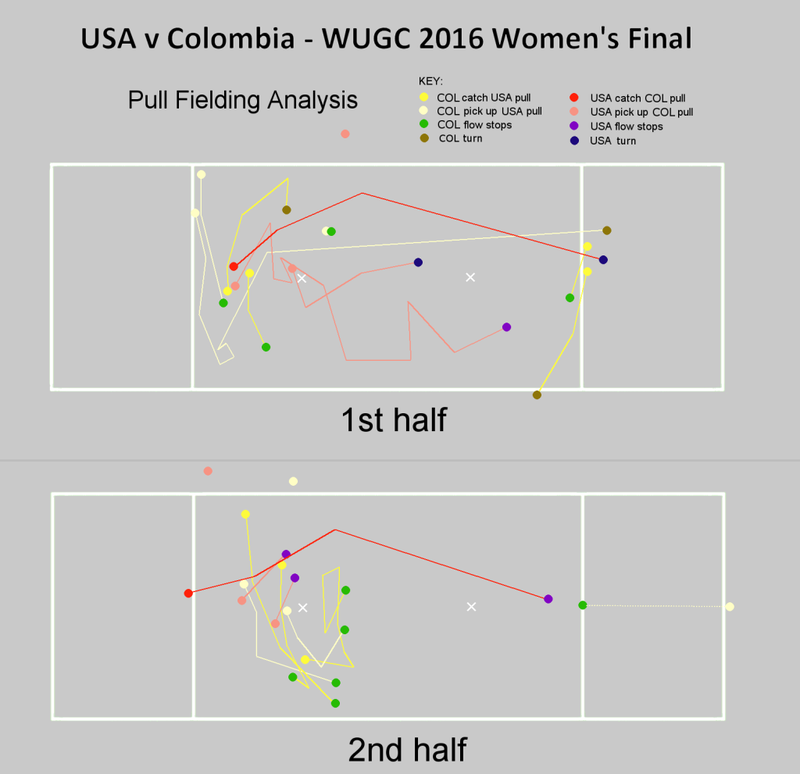 An element that added to the confusion was that two USA players simultaneously moved into the backfield. Combined with the misleading communication from Takahashi, this is what caused Koike to momentarily lose track of the spread of offensive players (to miscount). Japan are not immediately punished for this slip, however at the end of the clip the knock-on effect is that #17 Furikado doesn’t have a mark, and there’s a free player towards the top of the screen – which is where the next USA pass goes. There is a moment in this clip where Japan swarm towards the disc – this is when Mickle does a 270 spin, and it’s a window of opportunity for a Japan D. Each option begins to be closed down just *before* the thrower focuses on it – the relative speeds throw him off – so he ‘looks off’ two reset throws without even a fake (I think he should fake quick-but-possible throws to get the defenders to commit). How could Japan have better used their window of opportunity? If the Japanese defender at the top of the screen had stuck to the player he quickly closed down at this moment, and prevented the dump pass, then there would likely have been a bid on the next pass, or at least very high stall. You can see that the excellent movement to close down the option at the start of this clip started a chain reaction in the Japan defence – probably aided by on-pitch communication – which becomes apparent at the end of the clip, when the deep defender comes in to cover Beau – good timing if he were to get a bid after Mickle’s 720.